Davao, like many other cities in the Philippines, is a multi-cultural society. Different ethnic groups celebrate their distinctive festivals, thus, the many exciting events and festivities that take place throughout the year. Araw ng Dabaw, also known as Davao City Foundation Day, is a week-long celebration that culminates every 16th of March. It is marked with a socio-civic and military parade, sports competitions, and fireworks. Observed every third week of August, Kadayawan Festival is Davao City’s biggest and grandest festival. The term “Kadayawan” is derived from the Mandaya word “madayaw”, a greeting used to explain a thing that is good, valuable, superior, or beautiful. It is a week-long celebration and thanksgiving for nature’s harvest. During this time, locals and tourists flock the streets of the city to witness major events such as the Indak-Indak sa Dalan and Floral Float Parade. Filipinos are known to celebrate the longest Christmas holiday season in the world, and Davao is no different. 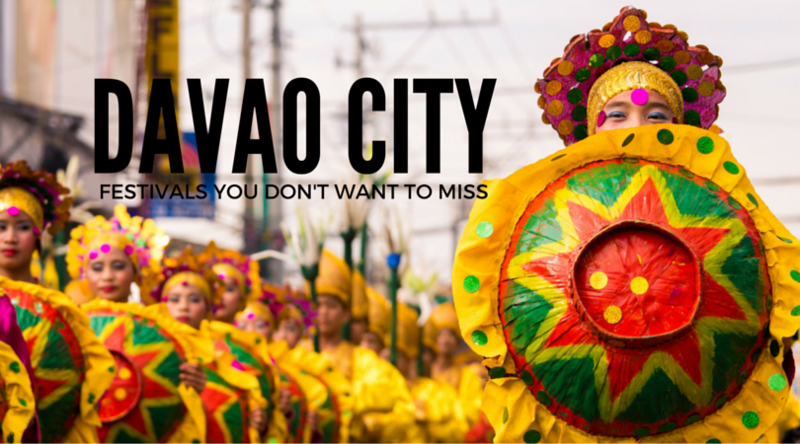 For an entire month, the city beats with exciting festive and competitive Christmas activities for Pasko Fiesta sa Davao. During this season, the city is filled with colorful lightings and array of decorations. There’s also a series of competitive performances to showcase the community’s creativity and talents while keeping Christmas traditions alive. Created under Executive Order No. 01, series of 2009, the Davao Chinese New Year festival celebrates the harmonious relations of the locals with the city’s Chinese community. It promotes Davao’s Chinatown as one of the major historical, economic and cultural centers of the city. Highlights of the festival include a film showing, exhibits, motorcade, temple visits, nightly entertainment and the Chinatown Night Market. This is the second most important festival for the Chinese community, after the Chinese New Year. It is celebrated in the middle of the 8th month of the Chinese calendar, at a time when the moon is believed to be in its fullest and roundest. In Chinese culture, the full moon symbolizes wholeness and togetherness. Main celebrations involve moongazing, eating moon cakes together, and making Chinese Moon Festival lanterns.